Words like courage, resistance, legacy, or mission don’t always come to mind when readers think of children’s books, but since the late 60s, Black children’s book authors and illustrators have been creating work that subtly and boldly inspires readers to reenvision what we think children’s books are and can be. It wasn’t until after I had my first child that I understood just how important children’s books were. Talking bears were great, letters of the alphabet were fine, barnyard animals teaching manners and numbers were sweet, but something was missing. Books were a place we went to get glimpses of the world but what was missing from many of the books I saw was the very child I was reading to. Her communities and her family were often absent from bookstore shelves. Javaka Steptoe was born into a family dedicated to changing that. Both of Steptoe’s parents were artists. His father, the late John Steptoe, was an award-winning illustrator of 16 books,10 of which he wrote. Javaka explains that his parent’s home was their studio, which allowed him to be immersed in art from an early age. Initially unsure about what his life’s work would be, it became obvious when his first book In Daddy’s Arms I am Tall was published in 1997 to much acclaim and won the Coretta Scott King Award. The book prophetically begins with the Ashanti proverb “When you follow in the path of your father, you learn to walk like him.” Since then Steptoe has illustrated nine more books. 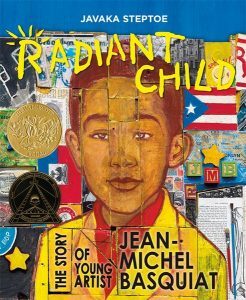 His latest, Radiant Child:The Story of Young Artist Jean-Michel Basquiat, is the second one that he wrote and illustrated. Radiant Child is a tour de force that smashes misconceptions about Jean-Michel Basquiat and exemplifies Steptoe’s love of experimenting with materials. In previous works he used coins, paper, buttons, fabric, soil, seashells, and even fish dipped in paint. In Radiant Child he uses wood found in dumpsters and on the streets as well as discarded material from the Brooklyn Museum as canvas. Everything– from the way Javaka Steptoe approaches artmaking, the stories he chooses to tell, and the detailed, loving notes he places in his books– feels like an invitation. Come see yourself and consider new ways to tell your story. His books serve as mirrors and lenses. In Steptoe’s world, we are whole. 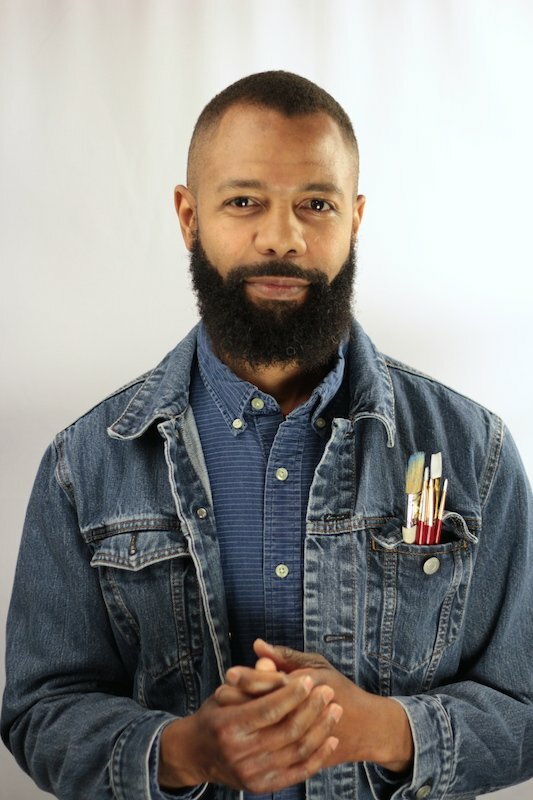 My conversation with Javaka was a journey into hip-hop, technology, privilege, Basquiat, The Four Agreements, the myth of absent Black fathers, and the stigma of mental illness. Steptoe chooses words as deliberately as he chooses colors and materials for his books. My father’s parents were from Virginia. They were used to a certain way of going about things and so I think, to one extent, they were really proud of my father but to another extent they didn’t get it. Both of my parents, John Steptoe and Stephanie Douglas, would hear things from their parents like how are you going to make money? When are you going to get a real job? My father was hearing this even after being successful with his first book. I’m glad I didn’t have to hear that growing up. At least not from my parents. At friends’ houses their parents would say that to me but it was weird to me. My parents were artists and I was still eating, I still had clothes. What we have is the opportunity to choose and our ancestors didn’t have that choice. You had very specific ways that you could do things (back then) and then you couldn’t do those things without permission. That’s a really horrible place to be as an individual. Our ancestors’ survival, and not just their survival, whatever resistance came about and allowed things to change to the way they are today– is what allows us to have this opportunity to play, to create, to have this privilege. It is a privilege. My father told me that the reason he created children’s books was that when he was growing up there were no people in books that looked like him, that spoke like him, that were doing the things that he was doing, or were doing the things the people in his community were doing. There was no humanity for Black people in children’s books. It’s important to have those images. In movies, books, on the radio however you’re inputting information. If you’re not seeing yourself in diversity: as a scientist, as a cop, as a nurse, as a florist, as an artist, then that’s not in your spectrum. For most people, if they don’t see it, then it’s not possible. I find it problematic. Art, with the quotation marks, was a privilege for the rich. I used to be a docent at the American Craft Museum and there was this big thing about what craft is and what art is. Really what it came down to is that craft is (seen as) what poor people do and art is what rich people do. Because craft was a beautiful utilitarian object. You didn’t just have time to make a painting that you couldn’t use. I write the notes in the books because I think it’s helpful. People are curious and they want to know what’s your process. To a certain extent it is to demystify the process. As an artist I’m always looking at how other people are doing things and figuring out how things were done. That’s my curiosity. So when I write these notes I’m speaking to the artists and the people who are curious. I also want to let children know how to do things. I want them to try making art. I want them to participate. Fight for your vision and don’t conform. You can’t excel by conforming. The Four Agreements says to always do the best you can. 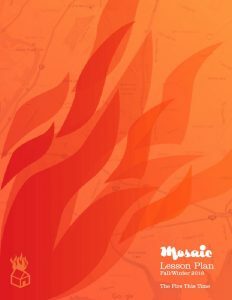 Everybody was excited about this book and everybody wanted to make this the best book possible. It’s 90% my voice. This was something I wrote too and so because I didn’t just illustrate it had a lot more control over it. As an artist you can’t be afraid to ask for what you want. You have to have a clear vision and believe in your vision. You do the research you see everything that comes up. You might have preconceived notions about some things but you never know what’s going to pop up. I tell people you’ve got to find the meat of the story. As things come up that are important to talk about you try to figure out a way to add that in. One of the things that happens when you do research on Basquiat is that you have people that say all this weird stuff. Assistants try to take credit for his work. People claim he took advantage of him but they were only around because he was who he was. So who was taking advantage of who? It’s always negative (when they talk about Basquiat) there is no humanity, no one is trying to understand where he is coming from. A lot of people heard about him from Schnabel’s film (Basquiat) which depicts him as wild, and abusive to his girlfriend. His girlfriend is depicted as a saint who works to keep drugs on his plate. If you read more than one book (even her book Widow Basquiat) you find out she was doing lots of drugs and partying too. They didn’t have a perfect relationship but there was love there. In her book I found out that he would bring his mother, who was hospitalized for mental illness when Basquiat was young, to the shows. He would ask his girlfriend to sit with his mother so people wouldn’t mess with her and she wouldn’t feel by herself. There’s a lot of tender moments in Basquiat’s life and things that people don’t really want to focus on about Basquiat. I guess they love the idea of the terrible black man. My first book book came out 20 years ago in the exact same month as this one. It also won the Coretta Scott King Award. Creating books for children is therapeutic. It’s an opportunity to go back and really dig around and explore that stuff you need to figure out so that you can go forward. When I worked on In Daddy’s Arms I Am Tall, my father had recently passed away and the book was a way for me me deal with that. With Radiant Child I didn’t have the same experience as Basquiat, my mother didn’t exhibit mental illness when I was a child it happened later on in life, but I had to deal with it. Sometimes that meant I had to be in all these crazy situations. [Long pause] There is a part of me that says I am a children’s book artist, I don’t want anyone to know that this ambulance is coming to my house. I don’t want anyone to know that this woman who is acting up is a part of me. One day it just came to me that they already know and people care. People are concerned. We live with this stigma but especially if you live in a community people care and people understand and people are helpful. The most important thing to pass down is that you should do what you love. Mariahadessa Ekere Tallie is the author of Dear Continuum: Letters to a Poet Crafting Liberation (Grand Concourse Press) which Split This Rock named a Spectacular Book of 2015 and Karma’s Footsteps (Flipped Eye Publishing). She is the Poetry Editor of African Voices magazine. Her work has been published in numerous literary journals and anthologies including North American Review, WSQ: Women’s Studies Quarterly, Black Renaissance Noire, Crab Orchard Review, BOMB, Paris/Atlantic, Mom Egg, The Golden Shovel (The University of Arkansas Press), The BreakBeat Poets (Haymarket Books), and Listen Up! (One World Ballantine). This entry was posted in Interviews and tagged African Voices, Black Renaissance Noire, BOMB, Coretta Scott King, Daddy’s Arms, Javaka Steptoe, Jean-Michel Basquiat, John Steptoe, Mariahadessa Ekere Tallie, Radiant Child:The Story of Young Artist Jean-Michel Basquiat, Split This Rock. Bookmark the permalink.